Our research on the effect of cloud overlapping assumptions on spectral fingerprints has been chosen as AGU research spotlight. Our research on radiative effect of TTL cirrus on tropospheric-stratospheric transport has been highlighted on Geophysical Research Letters. Please directly contact me if you are interested in opportunities of graduate study or postdoctoral research. We heartily invite self-motivated and talented s tudents to join our group. Given the interdisciplinary nature of our research, s tudents from all related fields are encouraged to apply. The related fields incl ude but not be limited to physics, applied mathematics, meteorology, environment al engineering. August 2018, Deparment of Energy News on the Earth System Model Development and Analysis awards, among which is a multi-institute project led by our group. July 2018, Prof. Huang is appointed as an editor for Journal of Climate. February 2018, Prof. Huang is a co-I on PREFIRE, an $35M Earth Venture mission selected by NASA for measuring far-IR radiation over the Arctic region. The NASA press release on the selection of this mission can be found here. November 2017, a proposal submitted to European Sapce Agency (ESA) to measure the far-IR portion of the outgoing radiation from our planet, FORUM, was selected as one of the two finalists competing for as the ninth Earth Explorer Mission by ESA. Prof. Huang is one of three non-ESA co-Investigators on this proposal. ESA Press release on this can be found here. June 2017, a proposal led by Prof. Huang and submitted to U-M and SJTU joint research program on data science has been selected for funding. This proposal aims to use machine-learning algorithms to improve the focast of solar irradiance and then electricity generated by PV (photovoltaic) panels. A new research direction for the group! May 2017, Zach Fair was awarded the highly competitive NASA Earth and Space Science Fellowship. May 2017, Fang Pan successfully defended her Ph.D. and, on the day before the defense, she was awarded the highly selective NASA Postdoctoral Program (NPP) fellowshp. Double congratulations, Dr. Pan! April 2017, Colten Peterson will join our group in this incoming Fall semester. He has been awarded the MICDE graudate fellowship and the Dean's fellowship for his outstanding academic standing. Welcome Colten! September 2016, our work on the use of commericial cloud computing for climate simulations is highlighted by Michigan Institute for Computational Discovery and Engineering. September 2016, Xiuhong has been appointed to Assistant Research Scientist. August 2016, we have published the first-ever global surface spectral emissivity database with full coverage of the entire longwave spectrum (link to the JAS article). January 2016, Yi-Hsuan has been awarded Dean's Fellowship for his academic performance. September 2015, Hongze has been awarded a merit-based travel grant by AGU Atmospheric Science Section for attending the Fall AGU conference in December. August 2015, Xianglei has been selected as a recipient of 2015 NASA Langley's Henry J.E. Reid award (news link). November 2014, We are among the winners of inaugural Amazon Climate Research Grant and marching towards the era of cloud computing with 5 millons of CPU hours from Amazon EC2 Spot Instances( Michigan news link). August 2013, Xiuhong's recent paper has been chosen by AGU as a research spotlight across all journals published by AGU (AGU news link). September 2012, we have another paper in press on Journal of Climate, in which a simple theoretical explanation has been given to account for the weakening of the Walker circulation from the radiative-convective equilibrium perspective(link to the early online release on Journal of Climate). July 2012, in the week of July 4th, our third and fourth papers on longwave band-by-band flux and cloud radiative effect studies were both in press on Journal of Climate. February 2012, Huiwen successfully defended her Ph.D. thesis! June 2011, Chunpeng's first paper is now in press on JGR-Atmospheres. March 2011, Huiwen won first prize (tie) in the 2011 MGU (Michigan Geophysical Union) for her work on atmospheric bridge. December 2010, Xianglei has been selected into the science definition team for CLARREO, a tier-1 mission recommended by the 2007 NRC Decadal Survey. 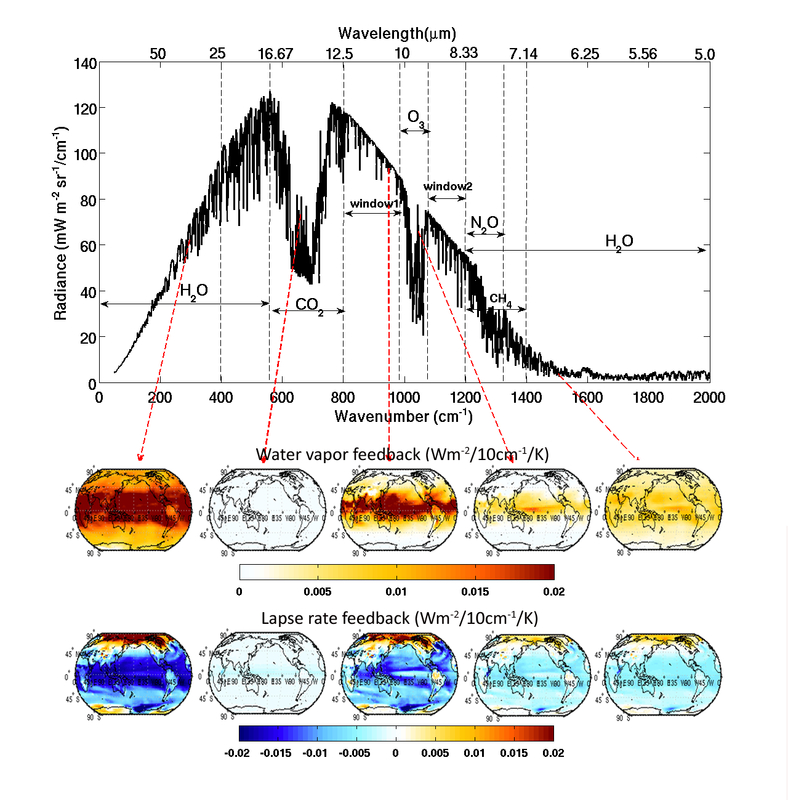 July 2010, Hui-wen's first paper is now in press on JGR-Atmospheres(link). March 2010, both Hui-wen and Chunpeng won prizes in the 2010 MGU (Michigan Geophysical Union).